Driving up Route 70, away from the Mexican border with Las Cruces and the wind at your back, you scan the dry and dusty New Mexican desert lands around you and know that a sign advertising the White Sands National Monument has to be either wishful thinking or a cruel joke. “White sands” usually conjures up images of Caribbean beaches, Greek stucco homes, or perhaps the shallow shores of the South Pacific. How could anything in this environment stay white enough to have the color in its name? But as you drive along the flat terrain with the air conditioner cranked up and the heat making mirages on the road ahead of you, suddenly you see… is that… snow? It can’t be. It’s 110 in the shade. Is it a salt mine? What the heck is that stuff out there? They are, just as advertised, 275 square miles of white sand dunes – hundreds of millions of years old, cool to the touch even in the sun-drenched desert heat, and a favorite of photographers from around the world. They were formed when a lake dried up right on that spot, leaving only the gypsum behind. It’s this gypsum that gives the sands their gleam, as opposed to the quartz sands of more traditional-looking deserts. President Hoover dedicated the site as the White Sands National Monument in 1933, after several decades of interest from promoters, developers and the National Park Service, less than 20 years into its role of curator, guide and protector of the nation’s natural treasures. Less than 12,000 people went to see the white sands that first year, but today the White Sands National Monument receives over half a million visitors per year who come to see this extraordinary testament to the evolution not only of the topography, but of the animals that inhabit the area. For example, some species of lizards indigenous to White Sands are lighter in color or even white. Researchers say this could be a combination of the classic “survival of the fittest” – that the lighter colored lizards were better camouflaged, thereby surviving long enough to have offspring, thereby resulting in more lighter colored lizards; and that animals with lighter skin or coats are able to survive the brutally hot summer temperatures. Perhaps the most fascinating desert animal is the kangaroo rat, which is able to survive without any need for water from external sources. Whenever it eats, its body produces what is called “metabolic” water during the digestion process. This keeps the animal hydrated in a desert environment, as does its burrowing tactic of sealing off its sleeping chamber so no moisture is lost. 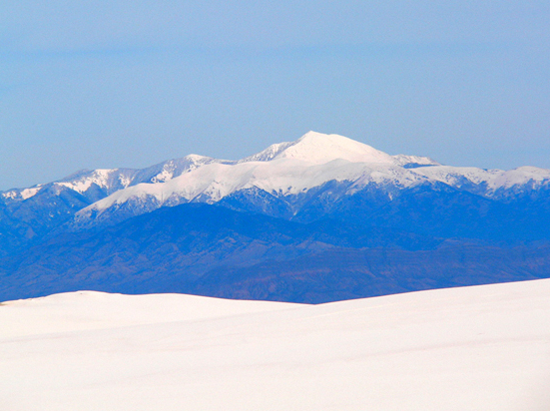 Whether it’s the anomaly of this white oasis of sand, the challenge to your senses or its pristine vista for as far as the eye can see, the White Sands National Monument can be said to call to the spiritual among us as well as those interested in science or the great outdoors. 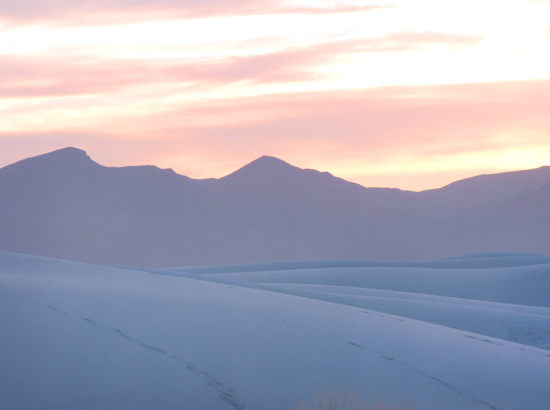 Many visitors have noted the sense of calm that seems to rise up from the dunes, perhaps because of the healing power of gypsum – said to relieve tension and even heal broken bones. 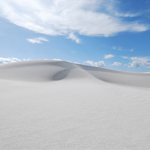 Native American legend has it that there is also a “ghost of the Great White Sands.” The ghost, named Pavla Blanca, is said to be that of a Spanish woman who came to the peculiar desert searching for her fiancé, a Conquistador who perished in a battle with the Apaches who were defending the land. She was never heard from again, and some have seen her floating above the dunes just after the sun sets.